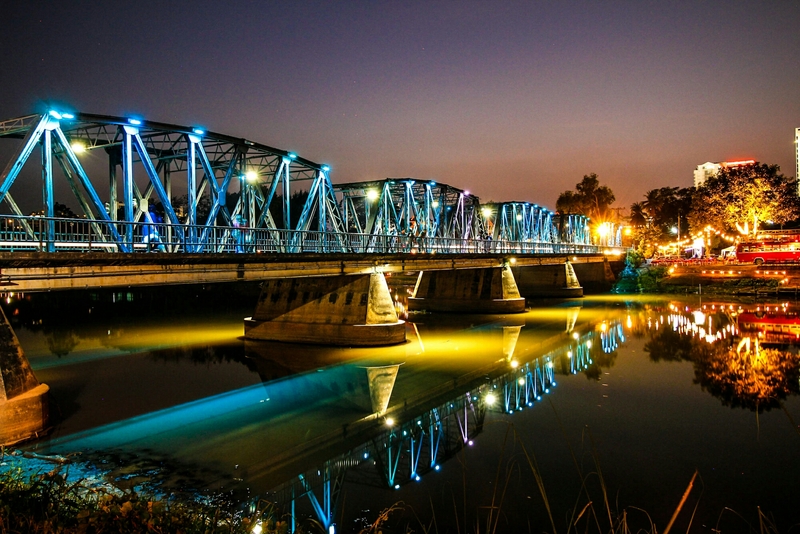 This is Iron Bridge in Chiang Mai, Thailand. We took this photo during a night photograpy workshop we had on 1 February 2017. We started a little before sundown and took a series of photos as night settled in. The bridge transformed from mundane to spectacular as night fell. This photo was taken on a Canon 100D. Specs are ISO 400, f/7.1, 4 sec, 18mm. This is a WOWZA beautiful photo. Thanks for sharing it with us. Each bridge support is lighted and the lights are programmed to cycle through several colors (like a string of Christmas lights). With luck, a photographer can catch all lights at the same color. However, there are two “rogue” lights that make photography challenging, being out of phase with the others (and with each other). We captured one at blue, but not the other. Next Next post: Did we just visit a people zoo?